Have an old smartphone lying around? Don’t let it sit and collect dust. Instead, sell it for cash. 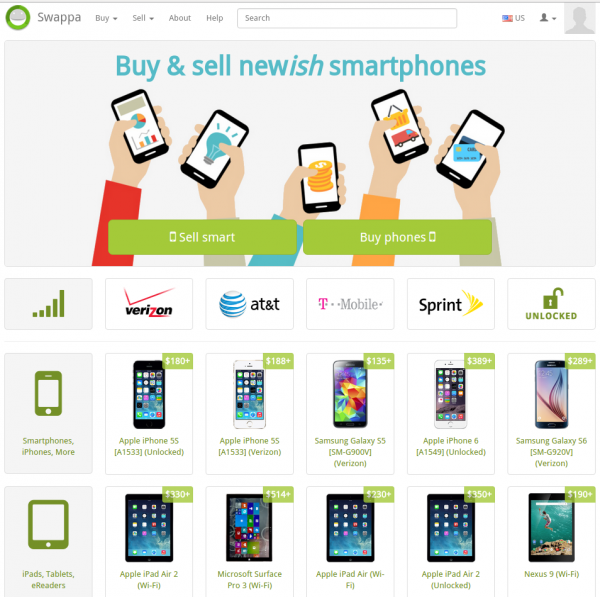 Online marketplaces make it easy to sell smartphones you’re no longer using. You just need to answer a few questions, post a picture or two and wait for a buyer to bite. Allan Hammell recently listed his wife’s Samsung Galaxy S5 on Swappa. It sold in 45 minutes. “I don’t know how many phones that I have set aside thinking I might repurpose, but never got around to it,” says Hammell, a project manager from Minnesota. He netted about $100 from the sale after postage and fees. “Better to reclaim some value while it still is worth something,” he adds. Swappa gives users total control over the sale: You set the price, deal directly with potential buyers, and package and ship the phone when it’s sold. Other sites, including Gazelle, do most of the work for you. Swappa: Your phone must be fully functional to be listed on Swappa. That means the screen, buttons, battery and ports must all work. It must also have a “clean” serial number, meaning it’s not stolen or under a contract or repayment plan with a cell phone carrier. To create a listing with Swappa, submit a photo that shows the full device, with the screen on and case removed, next to a listing code provided by the site. LetGo: This app, which is available on Apple and Android devices, lets you sell your phone locally. Start by downloading the app and creating an account using your email address, Facebook login or Google account. Then upload a photo. LetGo doesn’t charge fees to sell or buy phones. It also isn’t stringent about the condition of the phone, so you can sell devices with a little more wear and tear. NextWorth: Don’t want to deal with selling your phone? Trade it in for cash or a gift card. Just answer a few questions on NextWorth’s website to get a quote for your phone, then send it in for inspection to receive the final offer. If you agree to the price, you’ll receive payment within seven business days. If you don’t, they’ll return your phone at no cost to you, says Brendan McCue, a sales manager at NextWorth. You can also trade in tablets, laptops and other electronics. Gazelle: This site works a lot like NextWorth. You select the make and model of your phone, as well as its condition and whether it’s factory unlocked or with a carrier, and Gazelle gives you a quote. Then send your phone in and wait for your payment via PayPal, check or Amazon gift card. Allow a week or two for your phone to be shipped and inspected and another seven to 10 business days if you opt to be paid via check. Payment via PayPal and Amazon is instant. Gazelle accepts phones only from AT&T, Sprint, T-Mobile or Verizon. Another way to get cash from your phone: an old-fashioned garage sale. Joe Howard recently sold his iPhone 4 for $50 at a garage sale he organized with a few friends in Washington. Do a little housekeeping before you sell your old phone. First, confirm that the phone is no longer under a contract or payment agreement with your carrier. If it is, your buyer won’t be able to activate it and your seller reputation could take a hit, making it hard to sell any used devices in the future. Once you have a buyer, Lauren Fairbanks — owner of Digital Remedy, a chain of electronics repair shops — recommends taking the following steps. Back up your phone book, photos, videos and any other important information stored on your phone. Unlink your accounts from your phone. These include Facebook, Twitter, Google, iCloud, Find My Phone and Instagram. Android users can also encrypt their data before performing the factory reset on their old device to ensure stray texts or selfies stored on the phone aren’t visible to its next owner. The same is true for anyone selling an iPhone 4 or older model. Apple owners with an iPhone 4S or newer need not take this step; your personal data is encrypted by default.